A WIP using punchcard developed in previous post . 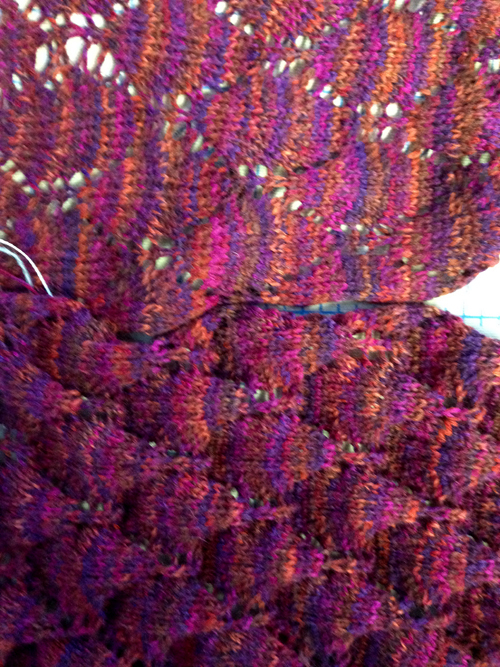 I missed a dropped stitch and wound up with a glorious run and giant hole, one of the ultimate joys of lace knitting. I find repairing such is more easily done if the knit is dropped off the machine, pressed lightly, and knitting is unraveled to the point where it can be re-hung on an all knit row. Lace traditionally is shown blocked, perhaps to maximize the eyelet pattern. If “left alone” it can have an interesting 3 dimensional surface. The latter is more likely to be retained if one uses a yarn with “memory”, such as wool, and knits the fabric in as low a tension as possible. The images below show my WIP, and the difference in the untreated vs. the pressed and steamed portions of the piece. The yarn is a hand/ machine knitting super-wash wool/ polyamide blend. 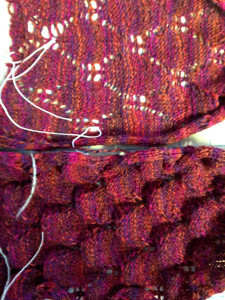 The manufacturer’s suggested machine knitting tension was 7-5, my cowl in progress is knit at 8.2 to make the transfers manageable.